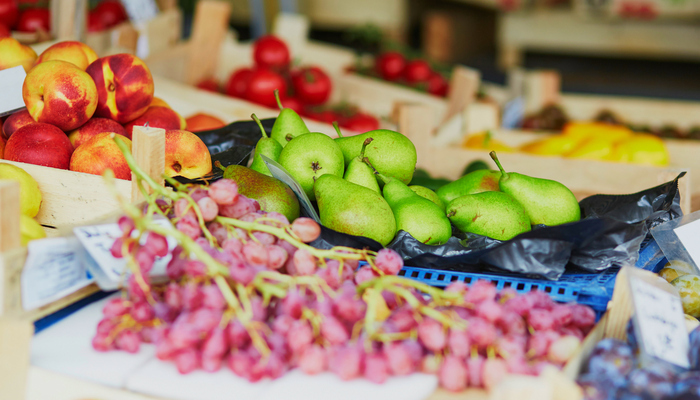 Local farmers markets can be a bit overwhelming, but with these 7 tips you can make the most out of your time and money. Farmers markets are a fantastic way to support local business and get the best quality ingredients to nourish your body. Food that’s minimally processed and as fresh as can be tends to taste the best, as the growing “farm to table” culture can attest to. While you typically can’t go wrong at a farmers market, here are some tips to help you make the most of your time and money. This includes gathering up your reusable grocery bags and thinking about payment. Some markets offer ATMs or vouchers to pay by credit or debit card, but those typically come with surcharges and fees. Cash is still the go-to for farmers markets, and it’s always a good idea to break up larger bills into ones and fives to make it easier to have exact cash in case the seller doesn’t have enough change. You also might want to consider bringing a cooler in case there’s a local band playing or another type of show you want to stick around for without your greens going limp in the sun. 2. Know what’s in season. It goes without saying that you shouldn’t expect to find local bananas in the middle of Chicagoland, or fresh cherries in October. If you have a good idea of the crop calendar you can save time and have better expectations of what produce you might find on any given weekend. One of the best parts of shopping at a local farmers market is being able to try produce at the peak of its natural season. You can usually find a crop calendar on the farmers market website, or you can visit the information booth with any questions you have. It’s easy to get overwhelmed and not know where to go at a farmers market. There are so many vendors selling similar items that it can be hard to know what to get from where. Even if you don’t typically meal prep or plan meals ahead it’s a good idea to have a rough idea of what meals you want to create that week and to have your eye out for those ingredients. If it’s one of your first times at that particular market you may want to take a lap or two before purchasing anything to make sure you’re getting the best products at the best prices. While it’s important to have some sort of plan, it’s also important to know when to through that plan out the window or change it on the fly. Maybe you were thinking of having grilled steak and potatoes one night, but then you unexpectedly see some gorgeous squash blossoms that would go perfectly with the steak. By being open to spontaneity you also keep yourself open to trying new ingredients you’ve never had before. The info desk is there if you have any questions about the farmers market itself, and the farmer or sellers are also a wealth of knowledge. Want to learn more about a unique ingredient you found? Ask the farmer what the fruit or vegetable is, its flavor profile, and their favorite way to prepare it. Even if you run across one of your favorite ingredients you can ask to see if there’s a new recipe or preparation you hadn’t thought of before. Who knows, maybe you’ll find a new favorite food or recipe! 6. Learn how to store and prepare. The last thing you want is your beautiful fresh produce to go bad before you get the chance to eat it. Find out the best way to store each item and take the time as soon as you get home to prepare it for storage. If you saved some money and bought something in bulk figure out how you want to store it for the long haul, whether it’s by freezing, drying, or canning. You can also find recipes to use up ingredients, for example if you have a lot of left over berried make a pie! One way to enjoy the local farmers market is to volunteer to work. If you make friends with a local farmer you can offer to man their booth for the day, or you can help out the market manager with the organization of the event. Not only is this a great way to increase the local economy, oftentimes volunteers are compensated with fresh produce or locally-sourced meats and eggs.